The arrival experience is casual and laid back. The gravel, sandy parking lot marks are non-nonchalant atmosphere and this is echoed once inside. The dining room and inside bar are second fiddle to the expansive deck and dock outside. 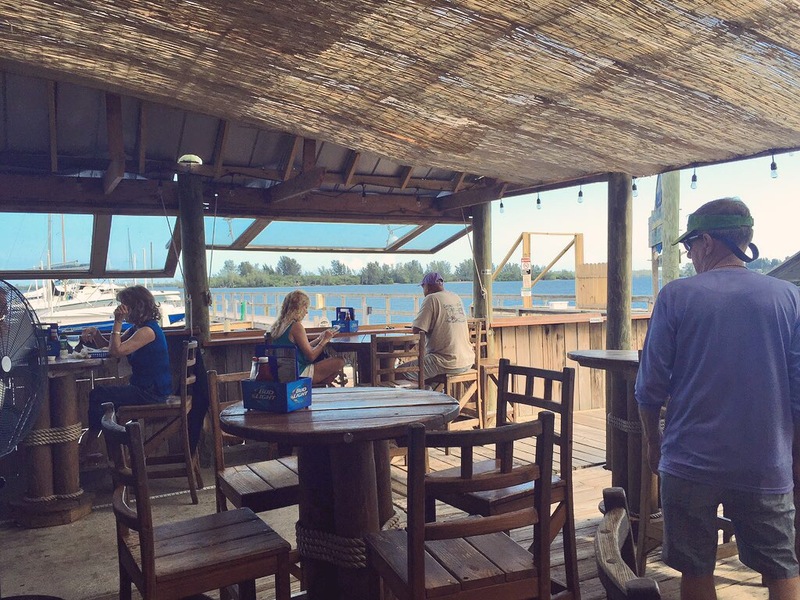 There are a variety of tables and counters with bar stools that overlook the water. My favorite is the backside seating area with pairs of boat chairs. This Florida girl felt right at home here. 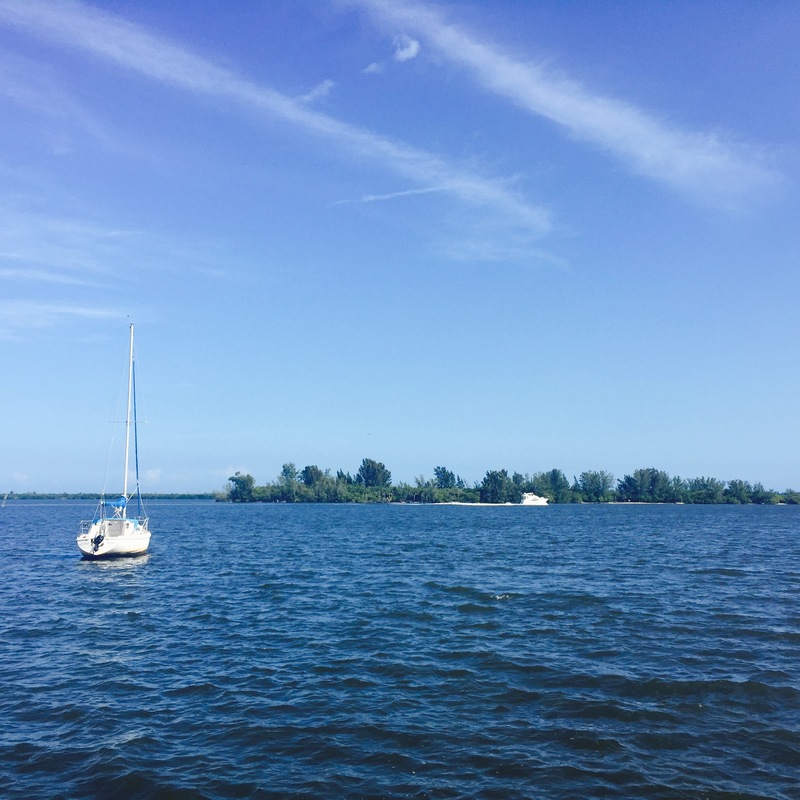 Settled along the shores of the intercoastal, the water is calm and watercraft of all shapes and sizes easily navigate their way though. 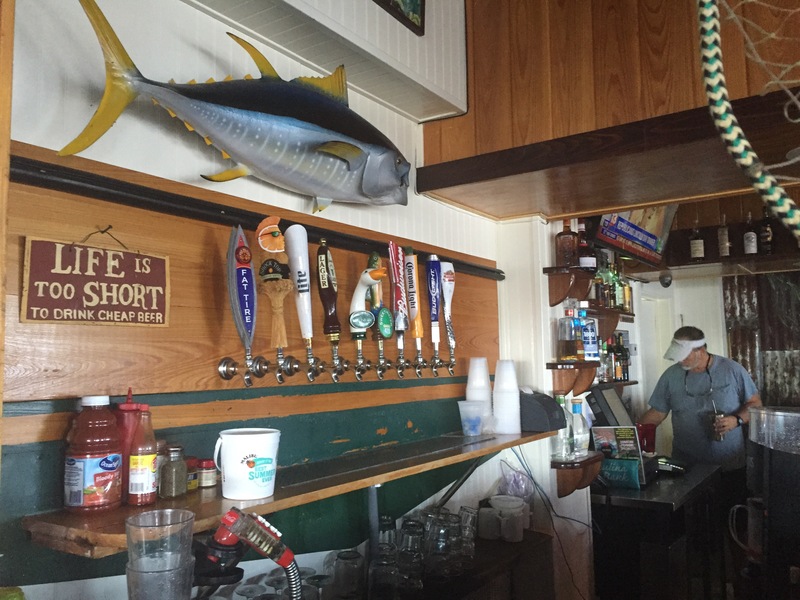 In fact, Old Fish House is part restaurant and part marina. Plenty of boaters “dock and dine” here. Two of my favorite beach beers are available and served ice cold: Pacifico and Landshark. The Parrothead in me just couldn’t resist the chance to savor a Landshark, Jimmy Buffett’s beer, while gazing out on the deep blue sea. My family and I sipped on our drinks and chatted. Our time at Disney’s Vero Beach Resort had already put us at ease, and as we sat outside, a slight sea breeze coming in, relaxation washed over us. I looked over the stage area that hosts live musicians on the weekends. Yeah, I could definitely see myself coming back here, and we hadn’t even had the food yet. A few of us ordered a side salad with our meal, which were delivered to us about 10 minutes after our drinks. I went with the 1513 salad, which is a variation of a popular Spanish recipe found throughout many Florida focused restaurants. Iceberg lettuce is dressed with a simple vinegerette adding a nice tang that does not overpower. Green olives, cojita cheese, and diced tomatoes finish off the salad. The cheese and olives make this salad a bit salty but the cool tomato and lettuce balance it out. Due to building regulations and its incredible location right on the water, the kitchen cannot have a commercial dishwasher, therefore everything is served on Styrofoam and plastic. I would encourage management to look at biodegradable options for both their plateware and cutlery. It felt a bit wrong to be basking in the natural beauty of Florida’s intercoastal waters while using materials that will sit in a landfill and not break down. This downtrodden thought did not linger long however, the quality of the food taking over. 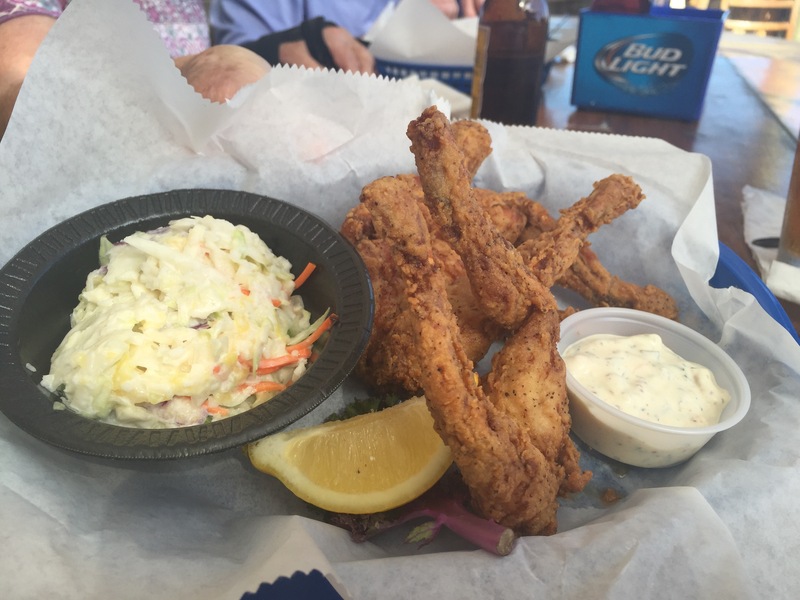 The Old Fish House always offers a fresh catch of the day. During our visit they offered two options, I went with the tile fish as I have never had the pleasure of trying this white fish. The menu also featured a fair amount of dishes made with red fish, a very popular choice in Florida. 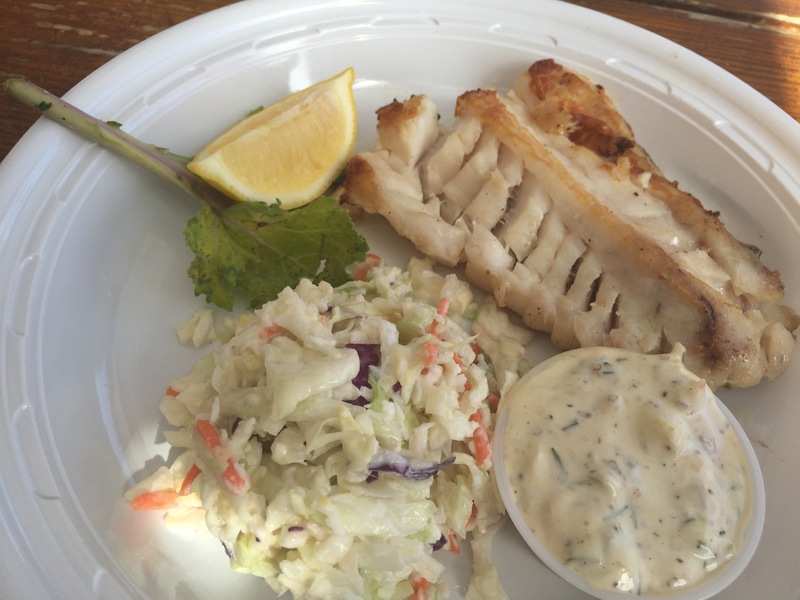 The fresh catch can be grilled, blackened, or fried. I went with the simplicity of grilled and did not regret it. A fresh squeeze of lemon from the lemon wedge on my plate added a nice brightness to the fish. It was firm, meaty, but mild. It was the perfect choice for the setting. The accompanying tropical slaw is a light cole slaw, not too heavy on the dressing with touches of pineapple and coconut. 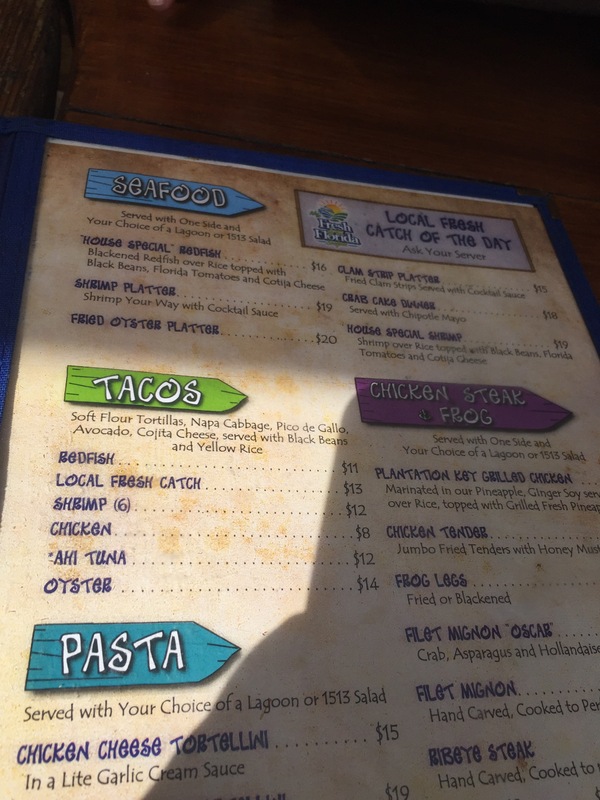 I love how the menu is a flavorful combination of simple Florida seafood, Spanish, and Caribbean influences. My father ordered the House Special Red Fish which is on my list to order on my next visit. 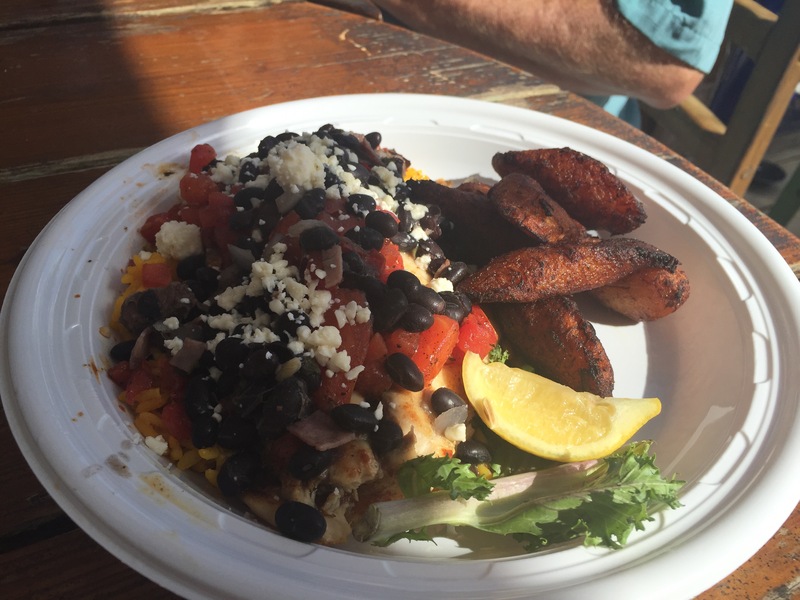 This dish is composed of blackened red fish served over yellow rice and black beans, topped with tomatoes and cotija cheese. It looked delectable! My aunt ordered the frog legs, fried (as opposed to blackened). I have always wanted to give frog legs a try; they are both a popular choice in Floridian cuisine as well as French cooking, so they can’t be that bad right? It is cliche but indeed they did taste like chicken, a leaner, less greasy version of fried chicken. I am glad I tried this dish, but given the array of fresh fish available here I don’t see myself ordering them on another visit. As we each tasted our meals, we remarked on our enjoyment. In a rustic, oceanside establishment such as this you often set your expectations low. So many beach bars and grills focus on their location and not so much on the food. I am pleased to say this is most certainly not the case here at The Old Fish House. From Orlando it is about an hour and a half drive, definitely worth it in my opinion. And if you’re visiting Cocoa or Vero Beach then you must make a visit. The atmosphere, the location, the service, and the food all satisfied and pleased this Florida girl. I want to go back! Great write up!